With the new common core, we now have to make sure our students are reading at their highest able level and that their text is more complex than before. It’s in the standards, whether anyone likes it or not. During a reading workshop that I attended, I heard about this idea that helps release students gradually into the world of more complex texts. It’s called using the ladder of complexity. Here students start reading a book that they would normally choose and then work their way up to a more complex text. They also explain why they believe the book is more complex. Of course, you can always make sure you instruct students on what makes a text more complex. 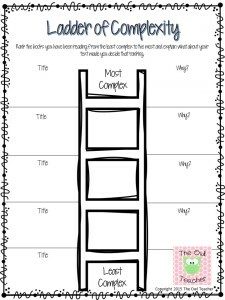 There is more detailed information on my blog where you can download this free organizer. Just click here.